The mechanism is studied using ωB97XD/6-311G(d,p) with a simulated solvent (acetic acid) included (but not explicit solvent setting up any hydrogen bonds). Transition state HCl + H2C=O. Click for 3D animation. At IRC 4, the HCl starts by aligning itself into the plane of the formaldehyde, with the hydrogen targeting the in-plane lone pair on the carbonyl oxygen. At IRC 2.2, the hydrogen atom starts to transfer from the Cl to the O. As usual, a hydrogen transfer takes place very rapidly, and by IRC 1.7 the transfer is largely complete. At IRC 1.5, the chlorine, now shorn of its proton, starts to move out of the plane. 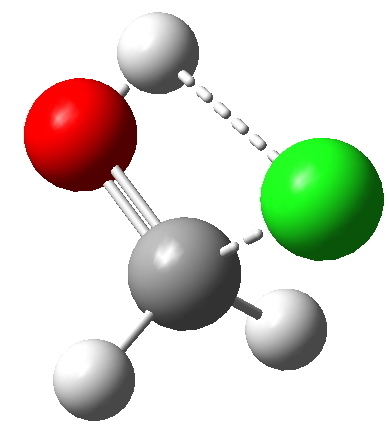 At the transition state (IRC = 0.0) the chlorine is now inclined at an angle of about 45° with respect to the plane of the formaldehyde (which is still largely co-planar). Between IRC 0.0 and -2.0, the Cl…C bond starts to form, and the rotation goes to about 73°. It is held at this position because of an anomeric effect operating between one of the lone pairs on the oxygen atom, and the axis of the C-Cl σ* bond. The overall process is concerted, but quite asynchronous, in as much as the formation of the O…H bond distinctly precedes that of the C…Cl bond. These bonds form at a dihedral (torsional) angle of 73° with respect to each other and the need to align the two bonds in this manner means that they cannot form at the same rate! Is this model a realistic one? Well, the missing component is hydrogen bonds. Between a solvent (this is being done by the way in acetic acid as simulated solvent) and the chlorine, which must assume a large measure of being actually a chloride anion, countered by the oxenium cation. It is possible that the reaction may actually therefore not be concerted, but it might stop at the half-way stage of an ion-pair before continuing its journey. The calculated barrier (~20 kcal/mol) is actually quite reasonable for a thermal reaction, but hydrogen-bond stabilisation might be expected to reduce this to what in effect would correspond to a very fast room-temperature reaction. Well, HCl + H2C=O does not sound complicated. But you can trust this blog to take something simple and make it less so! This entry was posted on Thursday, May 24th, 2012 at 3:07 pm and is filed under Interesting chemistry. You can follow any responses to this entry through the RSS 2.0 feed. You can leave a response, or trackback from your own site. Surprises (?) in the addition of HCl to a carbonyl group. is licensed by Henry Rzepa under a Creative Commons Attribution-Noncommercial-Share Alike 3.0 United States License.